As a parent, I am always looking for ways to improve my children’s’ health. We exercise as a family, garden, and eat as many homemade meals as possible. No convenient foods in my pantry. But when it comes to our camping trips, this is a different story. Yes, I admit I go for the canned stuff and sometimes I even fix beanie weenies or just canned beef stew. While this food does fill our stomachs, I know it is not as nutritious as good old home cooking. But what is one to do when you have to carry in and out everything you are going to consume. Well, I have the answer for you and no it is not something odd like kelp nor is it something that tastes terrible. What is it you may ask? Well, it is the VegThisWay's Rawr Bar. 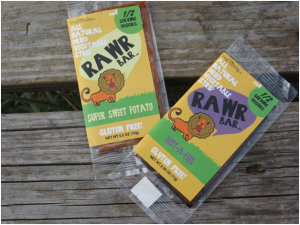 Ok, what is a Rawr bar? It is the most delicious fruit and vegetable leather you can imagine. It is not the old fruit leathers you can buy in the local supermarket but instead is something that is nutritious and not full of sugar. Each bar contains a half a serving of fruit and a half a serving of vegetable. This leather has no preservatives and the color of each leather variety comes from Mother Nature and not a chemistry lab. Also, if you read the ingredient list on the back of each leather, you will find that the only things listed are items that you would find in the produce section. As an example, the Beet-A-Peel fruit leather contains pureed beets, pears, orange juice, and lemon juice. The best part of this product beyond the taste is the fact that I now can provide healthy snacks for my kids without the bulk. These bars fit perfectly in a backpack. The wrapping is also minimal and is easy to carry out of the park or off the trail. I mean frankly how much does a simple, clear wrapper actually weigh. But even if this product did have a lot of excess packaging, I would still carry it. It is that good in taste and creates an opportunity for healthy eating. The other aspect to the packaging that I find very important is the logo. While my children have never been picky eaters, I do have friends whose children refuse to eat vegetables and/or fruits. The little lion on the fruit/vegetable leather makes anyone one to take a bite. My only complaint about this product is I wish they had been around sooner. While I have done the store bought varieties for camping trips and yes I have even made my own, I love the convenience of just going to the pantry and loading up my pack with healthy foods. After discovering the Rawr bar, I will no longer go for canned fruits instead my family and I will eat our way to a healthy lifestyle one trail at a time thanks to Rawr bar.